The stage was a little more crowded than expected at a recent union gathering in Barre. Joining Vermont's four declared gubernatorial candidates at the AFL-CIO's annual political conference was a familiar character billed on the program as a "possible candidate for governor." His name: Former ambassador and state senator Peter Galbraith. "I'm exploring a bid for the governor, and that's an important constituency," he explained later. "If what I have to say doesn't resonate with, if you will, working people, then there isn't much basis for a candidacy." The field of candidates seeking to replace retiring Gov. Peter Shumlin hasn't changed since last November, when House Speaker Shap Smith (D-Morristown) suspended his campaign to care for his ailing wife. That left two Democrats — former transportation secretary Sue Minter and former state senator Matt Dunne — and two Republicans — Lt. Gov. Phil Scott and retired Wall Street banker Bruce Lisman — in the running. They're likely to have company. In addition to Galbraith, two other Democrats appear to be giving the race close consideration: former state representative John Moran and Speaker Smith, whose wife, Melissa Volansky, is almost done with her cancer treatments. Smith's friends and allies are not so quietly talking up the notion of his reentering the race, assuming Volansky's health continues to improve, and the speaker hasn't closed the door on the option. "You know, I think it's tough to say at this point in time," says Smith. "We are really trying to figure out how to get the kids to basketball games and who's gonna cook dinner and who's gonna run the house. So I'm trying to focus on that and trying to keep the noise about the other stuff down as much as possible." But the noise continues to grow, in part because neither Minter nor Dunne appears to have consolidated the support of their party. They've both been raising campaign cash, though, while Smith hasn't. Dunne is expected to disclose a healthy treasury next month when campaign finance filings are due for the first time since last July. That has led some to suggest that the speaker might be better off entering the lieutenant gubernatorial race, which would cost less. Either way, Smith's hiatus from the campaign trail might have helped more than hurt. As a sitting speaker, he faced any number of political land mines during the four-month legislative session. After suspending his campaign, he became a far less appealing target to those who might undermine his legislative work to damage his candidacy. Smith himself says he can't quite tell whether there's room for him in either contest. "I just don't know," he says. "I don't really have a sense of how the governor's or lieutenant governor's races are going outside the [Statehouse]." A moderate Democrat, Smith wouldn't satisfy those in search of a candidate to the left of Minter and Dunne. "I'm still holding out hope that we'll get someone who will run as a progressive and will talk about and champion all the correct issues," says Vermont Progressive Party chair Emma Mulvaney-Stanak. "I haven't seen that in Mr. Dunne or Ms. Minter at this point." Both Galbraith and Moran sound prepared to answer that call. "I think people are angered by a rigged economy, working longer hours for less pay while most of the fruits of their labor are going to the top 1 percent," says Moran, a substance abuse counselor from Wardsboro. "We need a progressive voice in the Democratic primary. I think it's time to have the political revolution." Sound familiar? Moran admits he may be channeling Sen. Bernie Sanders (I-Vt.), on whose behalf he knocked on doors two weeks ago in New Hampshire. But a focus on raising the minimum wage and guaranteeing paid sick leave is nothing new to the lifelong lefty, who chaired the Working Vermonters Caucus during his four terms in the House. Moran, who says he's "seriously considering" a run, recognizes the challenges he would face: He is virtually unknown outside his Deerfield Valley district, whose voters ousted him two years ago in favor of Rep. Laura Sibilia (I-Dover). But he thinks he'd be competitive if he could qualify for public financing, which would provide up to $150,000 for the primary and $450,000 for the general election. "If I decide to run, I would run to win," Moran says, adding that he will make a decision "within a month." Galbraith, too, has his eye on the party's left flank. His message: He'd fight for "economic justice." "I believe there is a significant component of the Democratic Party that's disappointed with how the Democratic administration and legislature functioned over the last six years," the Townshend resident says. "There was a lot of promise of progressive action and very little actual results." In his speech two weeks ago at Barre's Old Labor Hall, Galbraith said that instead of giving tax breaks to out-of-state corporations, "Vermont's next governor" should raise the minimum wage, provide universal health care and bolster public services. "He did very well," AFL-CIO political director Dennis LaBounty said of Galbraith's speech. "I mean, he has a real good track record with labor." Galbraith has other advantages: an unbeatable résumé (former ambassador to Croatia), a famous last name (son of the renowned economist John Kenneth Galbraith) and plenty of resources ("perhaps a hundred million or more dollars" in Kurdish oil money, according to the New York Times). Sure, the two-term state senator, who didn't seek reelection in 2014, was never a beloved figure in the Statehouse, but perhaps that could be an asset in the "year of the outsider." His outspoken opposition to industrial-scale wind would surely agitate the renewable-energy industry, but in a crowded Democratic primary it could attract many like-minded activists. So how serious is Galbraith, who flirted with a gubernatorial bid back in 2008 and has been kicking around the idea since last summer? "He's running," says one Windham County Democrat who has spoken with Galbraith about his plans. "Because he's goddamn fearless, and you know it." Sen. Patrick Leahy (D-Vt.) looked pretty pleased Monday morning as he stepped out of a broadcast studio in Burlington's Old North End and faced a scrum of reporters eager to ask him about an unexpected opening on the U.S. Supreme Court. For months, Vermont's senior senator has been starved of attention as Sanders, his junior colleague, hogged the headlines. When Republicans took over the Senate last year, Leahy lost his Judiciary Committee chairmanship, his ceremonial position as Senate president pro tempore and the security detail that came with it. Now it's Sanders whose New North End home is monitored 'round the clock by the Secret Service. But with the death last weekend of Justice Antonin Scalia, Leahy's back in the mix. As ranking member of the Judiciary Committee, he'll lead his fellow Democrats into what's expected to be the most contentious Supreme Court confirmation fight in modern times. "This is one of the reasons he stayed in the leadership of the Judiciary Committee," says former Leahy chief of staff Ed Pagano, referring to the senator's December 2012 decision to take a pass on the highly coveted chairmanship of the Senate Appropriations Committee. "This could be a pretty momentous vacancy." The Monday presser was classic Leahy: He repeatedly referred to his wife, Marcelle Leahy, and their Middlesex vacation house, where they stay when not at home in McLean, Va. Referring to the couple's woodstove, he said, "I do a great job with that. Don't I, Marcelle?" "Yes, dear," she dutifully replied from her seat behind the reporters. "Marcelle runs the woodstove," the senator said with a chuckle. "She knows better than to have me do it." Leahy wistfully recalled passing the time with Scalia on the sidelines of their sons' soccer games. And he made sure to mention, at least four times, that he had "talked about Supreme Court justices with many presidents" — including the current one. "I'll meet with him next week," Leahy said. "I'll make some recommendations. He'll go over some names. But I know from our conversations with him Saturday night, he's already got some names in mind." As usual, Leahy brought a prop: a copy of the U.S. Constitution. "I said in an earlier interview today that Sen. [Mitch McConnell (R-Ky.)] was using the Republican playbook to block having anybody [nominated]," he said, holding up the pamphlet until every camera in the room had documented the moment. "I use this playbook: the Constitution." Leahy's boosters say he's just the right guy to help Obama push a nominee through the Senate. He can use his relationships with senior Republican colleagues, such as Judiciary Committee chair Chuck Grassley (R-Iowa) and Sen. Orrin Hatch (R-Utah), to work through the deadlock — and he can take his argument to the court of public opinion. "He's been around the block a few times, and he takes this kind of thing incredibly seriously," says Luke Albee, who preceded Pagano as Leahy's chief of staff. "And look at his record. Look at who he's voted for. He voted for Scalia. He voted for Justice [John] Roberts. The idea that he's a knee-jerk partisan in situations like this just doesn't comport with the record." Politically, the timing of the showdown couldn't be better for the senator as he asks voters to extend his 41-year reign. It'll serve as a reminder that, in Leahy, Vermonters have a seat at the table — or in the Oval Office, as he'll surely remind them — during some pretty important discussions. Whether Leahy will draw an opponent this fall remains to be seen. 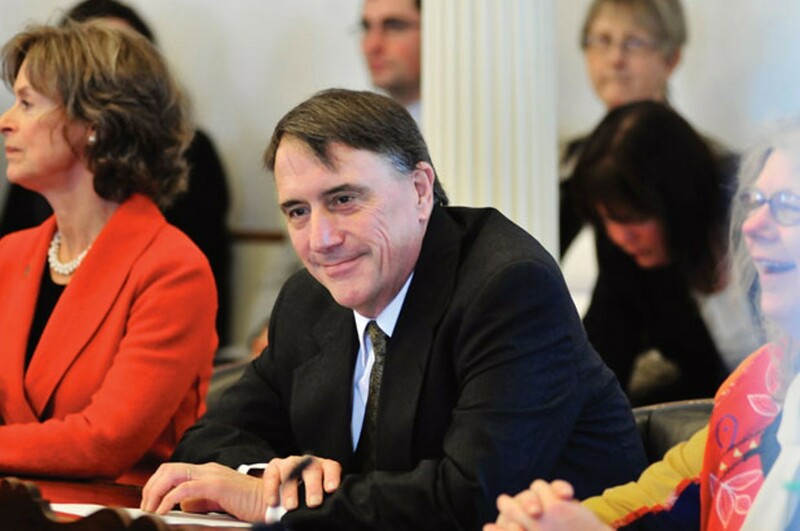 Pomfret Republican Scott Milne, who nearly defeated Shumlin in 2014, has been publicly mulling a challenge since last October. Rumor has it that he recently conducted a poll to gauge his chances. "If there's a poll that shows I've got a chance against Patrick Leahy, I'm not going to talk about that," Milne says, not so subtly. Though Milne says he hasn't decided whether he'll run, he thinks the looming confirmation battle will demonstrate that Leahy is "one of the most partisan people in Washington." Milne is quick to distance himself from Republicans who've vowed to block Obama's nominee. "My position is, presidents get elected to make appointments, and they should be given great deference to get their nominees through," he says. Leahy doesn't appear eager to discuss his potential opponent. When Seven Days asked about Milne at Monday's presser, he shot back, "You are the only person who keeps — are you working for him now? You seem to constantly bring up his name." In fact, as Seven Days pointed out, the paper had never once asked Leahy about Milne. "Several times you have," Leahy responded. "But you have a right to. You apparently have a soft spot in your heart for him." A soft spot, eh? Somebody touch a nerve? After 14 months at the Burlington Free Press, reporter Haley Dover is leaving March 4 for a new gig as public information officer for the state Agency of Education. According to Secretary Rebecca Holcombe, the agency is repurposing an existing position to respond to the "intense demands" associated with the state's new education governance law. "Haley will be a terrific addition," she says. "We are thrilled to have her joining us." According to Free Press publisher Al Getler, the paper plans to fill Dover's position, as well as two other vacant newsroom jobs. The Freeps is also raising its subscription price a dollar per quarter, it announced via postcard last week, to pay for "exclusive, special Sunday premium sections." Whether you want 'em or not.